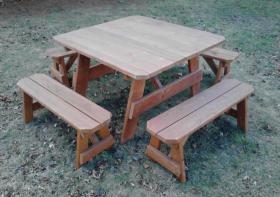 This 4'x4' heavy duty Picnic table is handcrafted by the Amish people in Pa. Seats up to 8 people. They offer seperate bench's for easy moving if needed. Stained or natural, which will weather to a nice silver over time. There quality is what they are known for. Enjoy this table for many years to come.